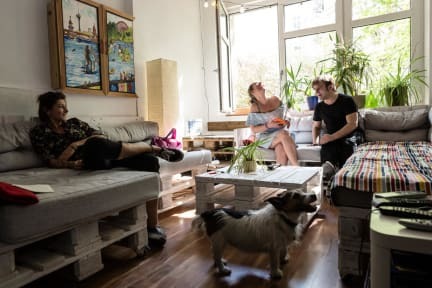 The U inn Berlin Hostel is a family owned, newly renovated, clean and gay friendly Hostel surrounded by cafés, clubs, small local vintage shops and bars. are equipped with safe lockers. Due to its exciting history Berlin has not got a real city centre but several districts each with their own unique character. Amongst young Berliners and travellers the three most popular districts are Friedrichshain, Kreuzberg and Neukölln. We’re located right in the centre of trendy Friedrichshain. Check out the city with our bicycles for rent. Our friendly staff will help you out, if you’re in need for recommendations for local bars, sights, or interesting events. To be friendly and open with each other is important to us, consequently we oppose any forms of exclusion based on sexual, political, or religious orientation. We welcome especially members of the LGBTQ+ community. If you set out to explore our Hostel’s surrounding area, you’ll find plenty of vintage-shops, lovingly equipped cafe’s, little flea markets, yoga schools, lots of kebab shops, all varieties of distinctive bars and organic shops, all of which have the unique feel, smell and character of the Friedrichshain area. I can't think of anything to complain about this place. It's not boasting wealth, but it's got a good level of comfort & all facilities are there. You have a key to your dormroom and can get a locker. Staff is helpful. Spacious kitchen there, fridge gets decluttered oftenly. Showers work. Common room, albeit not XL, has some nice things like guitars, books, games, music and a couchcorner. Public transport is nearby. The area is interesting. Haven't seen the yard, but it was cold outside anyway. When I arrived at U Inn Berlin I immediately felt like home. This is one of the best hostels I've ever stayed at! The room was spacious and clean, big lockers and comfy beds. The kitchen has everything you need and is a very nice place to meet other travellers. Overall very clean. If you want to go out, clubs and bars are close by. I found Friedrichshain a safe, pretty and lively area! And last but not least: the staff is awesome. Super friendly and helpful!! I will definately come back. A lovely place with friendly staff, personal lockers, clean showers, a nice garden to hang out in... It's easy to socialiste with other travelers or chill on your own. We felt very good and easy-going vibes. Situated in one of the most interesting neighborhoods in Berlin, the combination with all of the above is gold! Vies en geen respect voor welke regel dan ook. Gevolg weinig slapen en op je kamer meeroken met de wiet van anderen.